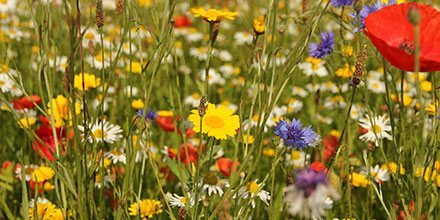 A quick reference guide for sowing wildflower seeds and then providing the necessary aftercare for getting the most out of your meadow. Preparing the Ground Wildflowers like poor soil conditions so starving the soil of nutrients will help the seeds to thrive. Rake over to create a level seedbed. Mow your wildflower garden at a high level during the end of summer. The right time to cut back your meadow is during late August or September and remove the clippings. Cut to 4cm in height. This will ensure your wildflower meadow is ready for the following year.